The view of the Rhine is currently frightening many inhabitants of Cologne and other inhabitants of the region. The water was constantly rising and some parts of the city are already facing flooding. This reminds many residents of the situation earlier this month, when water levels had already exceeded 8 meters. But this time, there seems to be no quick all-clear, because experts dare currently no forecasts. On Thursday, the levels on the Rhine in the region were around and in Cologne still at about 7.60 meters. The water levels rose slowly, so that the population already began to breathe easily. But on the night of Friday, the situation changed dramatically again. At the morning measurement, which took place around 6:13, a new water level of 8.01 meters was measured. Thus, the Rhine crosses the 8-meter boundary for the second time in one month, which means that the residents will have to wait a bit. Already at the beginning of January, the water reached a peak of 8.75 meters. With this mark, the point was then exceeded and the water levels began to fall again. Whether this point will be the limit this time, but can not be said at present. Although conservative estimates assume that the gauge will not exceed the limit of 8.60 meters, it is uncertain whether this is true, as the location around the nourishing vertex of the wave is too unstable. According to the latest reading from Friday evening, the water level was 8,11 meters with an upward trend. First floods can already be observed. The shore of the Bastei is currently under water again. But not only known places, but also inconspicuous areas of the city are currently not accessible. Along the shore countless roads are already affected by the flood waters. Although no residential buildings are currently affected and the water has not yet made its way into the city, it hits places that are a bit out of the way much harder. So for example the district Kasselberg in the north. Here, the water has begun again to enclose the small district. As in the case of the flood in early January, it may be necessary to re-set the docks for the residents so that they can reach the main roads from their homes. However, local people seem to have developed a certain routine, because there is no sign of panic or anxiety. All preparations are very orderly, much to the delight of the authorities. To protect the city from serious damage, the pumps in Cologne were reactivated. These serve to protect the channels from excessive water pressure and should therefore allow controlled drainage. The pumps are no longer stationary since reaching the 8-meter mark. Sliders were also closed to keep the water away from the vital veins of city traffic and to prevent the water from the canals in the city pushing upwards. Currently the measures can withstand the pressure of the water. In Cologne itself, there are no indications that damage caused by the flood is to be expected. However, the authorities have adjusted to the worst. So special strips are parked, which are to control the Rheinzufahrtsstraßen. Since the onset of the flood, there has been no stopping altogether in order to provide the emergency services with quick access to vital channels if necessary. Unauthorized parking vehicles are towed without exception. In and around Cologne, local and long-distance traffic are also affected by the flood. Many bus routes to the surrounding area can not currently be used and S-Bahn routes along the Rhine are largely decommissioned. Also the long-distance traffic is affected, so that some railway lines can not be used at present. However, efforts are made to provide a substitute for the failure with buses. In addition, the shipping traffic on the Rhine near Cologne is currently stopped . This was already the case during the floods at the beginning of the month, causing serious economic damage to inland waterway shipping. As the water has risen so much because of the continuing rainfall that the bridges of the city can no longer be passed by the ships, the authorities unfortunately had no alternative. Currently, the Rhine can be passed through the region of Cologne along the entire length of its run, not by ships. This Saturday, the peak of the flood is to be reached, at least in Cologne. Currently, the forecasts are quite sparse, so that a maximum of 8.50 meters is expected. However, this is only an approximate value, because the actual height of the flood depends heavily on the precipitation in the Moselle. If the rain falls here, the water can rise even further. This is precisely where meteorologists currently disagree, as the changing situation in this area is currently difficult to predict. Other cities like Bonn and Düsseldorf are currently preparing for a flood, but are waiting anxiously for the vertex in Cologne. If this falls lower than expected, then they can give an all-clear. Thus Cologne is due to its location also the yardstick for all following cities along the river. The flood situation at the beginning of the year also brought an advantage for the people. There are still many protective walls in and around Cologne that were built for the flood at the beginning of the month. As a result, only limited measures have been taken in many places, with the Technical Relief Organization has already put together supplies of sandbags again. These should be used to secure endangered areas of the dykes as the level continues to rise. However, another positive side effect is the accumulation of floods along the Rhine. 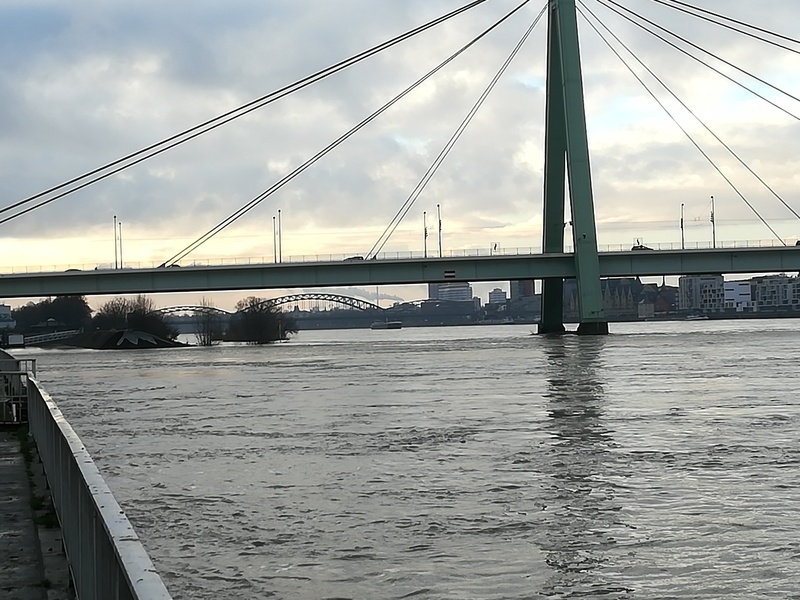 The city of Cologne and the state are making another 60 million euros available to significantly expand flood protection. Thus, the dikes should be renewed and many weirs and locks to be brought up to date. As a result, the situation can be better controlled at least in future floods. The current situation, however, remains tense until the summit has passed through the city. It is assumed that this will be the case around 7 o'clock in the morning. If you're planning a visit to Cologne, take a look at our apartments ! You'll love it and you can watch the flood on foot!